The 2010-2012 Dodge Ram 2500 and 3500 pickups equipped with the Cummins 6.7L Turbo Diesel offered heavy-duty truck buyers outstanding horsepower and torque, with a proven combination of advanced technologies. The Cummins B-series is a 6.7L (408 CID) six-cylinder inline turbo diesel engine. It is of an undersquare configuration, typical for a diesel and for generating torque, with a bore of 4.21-inches and a stroke of 4.88-inches. The compression ratio is 17.3:1 with incoming fuel delivered through a Bosch electronically-controlled high pressure direct injection system and air fed through Holset variable geometry turbocharger with air-to-air intercooler. The Cummins 6.7 L in the 2010-2012 Dodge Ram 2500 and 3500 trucks were rated with 350 horsepower at a relatively low 3013 rpm. The torque ratings ranged from 610 lb-ft to 800 lb-ft in the High Output option that was limited to only the automatic transmission. 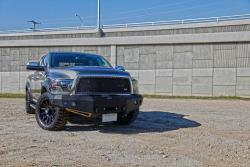 Since 2010-2012 horsepower and torque levels in newer Ram 2500 and 3500 diesels have continued to rise. For those owners who are seeking more power from their Cummins, we have a solution. For less than the cost of a set of monogrammed floor mats, a Spectre air intake system is designed to boost both horsepower and torque in your Ram 2500 or 3500 diesel pickup truck. And the Spectre 9991 air intake system for diesel RAM 2500 and 3500 pickups brings performance increases that can be achieved with a DIY installation that takes less than a Saturday morning with simple hand tools and no need to re-calibrate engine electronics. Even more so than gasoline engines, turbocharged diesels need a voluminous supply of air to operate a peak efficiency and power. With a Spectre air intake system you’re opening up that path to power by feeding the engine more than the stock system ever could. 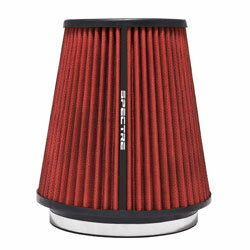 The Spectre 9991 air intake system utilizes a Spectre HPR0891 8.5-inch non-woven synthetic filter that’s designed specifically for the air flow and filtration needs of a diesel engine. Also included in the Spectre 9991 air intake system is a powdercoated heat shield that protects the incoming air from the hot engine so only cold outside air can reach the air filter. Cooler air is denser, carrying additional oxygen prompting your engine’s ECU to add more fuel, increasing horsepower. Incoming air is directed toward the cast aluminum intake tube via a velocity stack that helps speeds the intake air into the engine. 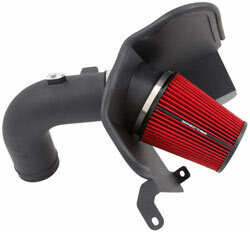 Spectre air intake systems come complete with all needed clamps, screws, and bolts for the look of an OE installation. OEM brackets and hardware are used so that no holes need to be drilled, making for a quick and easy installation. 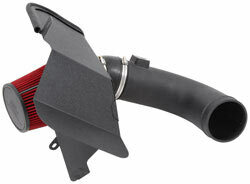 The kit also accommodates all factory emissions and vacuum lines. 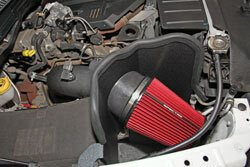 The Spectre HPR air filter element is washable and reusable. To maintain its performance, clean your Spectre filter after every 30,000 to 50,000 miles of normal driving, or more frequently if you drive in dusty conditions. The Spectre AccuCharge Precision Air Filter Cleaning and Oiling System part number HPR4820 was formulated specifically for Spectre HPR air filters and its precision oiling system features graduations on the bottle for precise measuring and an easy-to-use squirt top making the application a breeze. The system comes complete with a pump spray bottle of filter cleaner and one of filter oil, which is made from only pure food grade mineral oil. For almost 35 years Spectre has designed and sold unique and innovative parts and components to fuel your car or truck obsession. Our products are designed and tested to perform and last. We have a modern, computer-controlled chassis dynamometer that accurately measures horsepower and torque at the wheels. We also utilize a top of the line SuperFlow SF-1020 flow bench with airflow, pressure, and velocity measuring capabilities in both intake and exhaust modes to help develop our state-of-the-art products. So you can be assured that when you purchase a Spectre system, it’s well-engineered, well-tested, and should provide you years of service life.